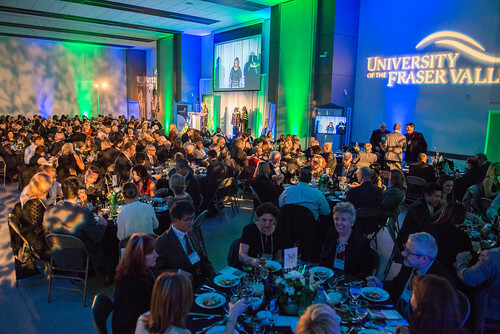 Town met Gown at the University of the Fraser Valley’s second annual fundraising dinner on November 9. More than 250 people gathered in the Student Union Building on UFV’s Abbotsford campus to celebrate student success and hear about how the support of donors helps UFV students. 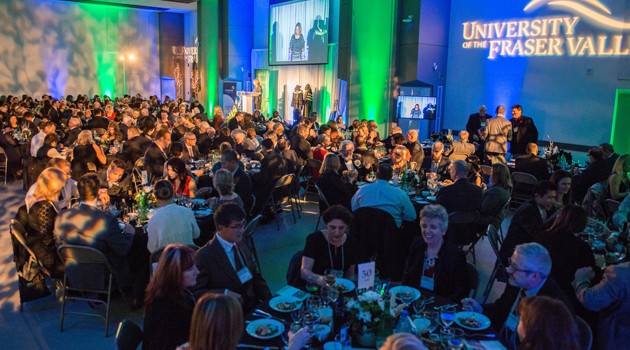 Proceeds from the Town & Gown event go to UFV’s Changing Lives, Building Community Endowment — supporting scholarships for students who demonstrate superior scholastic achievement, leadership, and commitment to the community. And this year, the net total after expenses was slightly more than $132,000. In a serendipitous coincidence, Town & Gown 2016 occurred exactly 10 years to the day after the Fraser Valley community turned out in droves to support university status for their local post-secondary institution. On November 9, 2006, nearly a thousand community members packed a local hotel ballroom to tell the provincial government that they needed to make their university college a full-fledged university. Nowhere else had the provincial government’s Campus 2020 review team seen such community support, so reminiscent of the way local community members fought decades earlier to bring postsecondary education to the Fraser Valley. UFV President Mark Evered thanked guests, many of whom have supported UFV over the years, for investing in the university. “We have built this great university on the vision of our community. We saw not only the educational opportunities for ourselves and our families, but the ways in which a local university would enrich us all — changing lives, and building community. It is that vision that continues to guide us today,” Evered said. Dr. Malwinder Dhami, an Abbotsford dentist and longtime UFV supporter and donor, also spoke at Town and Gown, announcing that he is funding three new bursaries: one to support the Dental Assistant program and two to support language studies (in Punjabi and in Halq’eméylem, the language of the Sto:lo people).“There is nothing like your native language, your mother tongue. It is the first language you hear, the first language you use to learn and understand and the first language you use to participate in everyday life….You can better participate and enjoy your culture and related activities through your mother tongue,” he noted. Student speaker and award recipient Sahil Chawla talked about how the support provided by scholarships and bursaries allows him to fully engage in campus activities.He’s a full-time UFV science student, majoring in biology and chemistry. He’s a student politician, serving as the Faculty of Science rep on the Student Union Society and an elected student rep on the UFV Senate. He’s a UFV Student Life Ambassador, leading campus tours, and a Supported Learning Group leader, and also president of the UFV Circle K club.Chawla, who hopes to go to medical school, has benefited from the support of UFV donors as the recipient of the Student Union Society Premier Entrance Scholarship and the Indo-Canadian Pioneers Endowment Leadership Award. “I am so grateful for the financial support of donors to UFV. Because of the financial burden being lifted through the funding I have received, I have been able to be involved on campus and give back to my university. And these experiences have given me so many chances to grow. I plan to give back throughout my life and career,” he said.The presenting sponsor for Town & Gown was Prospera Credit Union. Platinum sponsors were the Abbotsford International Airport and MNP. Gold sponsors were BMO, Chernoff Thompson Architects, and The Co-operators; silver sponsors were Quantum Properties, Esposito Group, Impark, Emil Anderson Construction; and bronze sponsors were Aldergrove Credit Union, Manulife, Minter Country Gardens, RDM Lawyers and Sevenoaks Shopping Centre. Special thanks to Save-on Foods. Media sponsors were The Abbotsford News, Chilliwack Progress, and Punjabi Patrika. Town & Gown is presented by UFV University Relations. Save the date for Town & Gown 2017 on November 8! Visit ufv.ca/giving.